Red beans and Rice is Louisiana’s comfort food. We are featuring an authentic recipe shared by my daughter’s co-worker, Mary Morgan, who grew up in Louisiana. Check out more delicious Cajun/Creole recipes: Jambalaya and Gumbo – plus lot more favorite recipes. In New Orleans, Red Beans and Rice is a treasured Monday tradition, where the aroma of red beans could be smelled drifting through the neighborhoods. Every household has their own secret list of ingredients and method for cooking the beans. Beans and rice has always been known to be inexpensive and high on nutritional content. Latin American countries and Native Americans used beans and rice as a staple long before the European settlers arrived in America. Red Beans and Rice finds its origins from New Orleans Creole kitchens back in the 1700 and 1800’s. The flavors of Creole cooking derive from several cultures combining French, Spanish, African, and Caribbean cuisines. An ancient Haitian recipe “Riz et Pois Rouges” which means Rice and Red Beans contains the same ingredients still found in many Creole cookbooks today. Inside Northside – Red Beans and Rice: Our Treasured Monday Tradition” by Judy Williamson Blasing, Sept/Oct 2010. National Geographic – News Watch Red Beans and Rice: A Monday Tradition” by Carolyn Gerdes or NY Young Explorers, July 2, 2012. * Can substitute 4 to 5 (15-ounce) cans red beans, drained of liquid instead of soaking dried beans. *** A ham hock is the lower portion of a hog's hind leg, including meat, bone, tissue, fat, etc. It is usually cut into 2 to 3-inch lengths and cured or smoked (or both). Can substitute pork neck, ham bone, or finely chopped pork jowls. **** Learn how to make perfect Fluffy White Rice. Soaking beans allows the dried beans to absorb water, which begins to dissolve the starches that cause intestinal discomfort. While beans are soaking they are also double to tripling in their size. You can cook beans without soaking, but it takes longer, and some people think the beans taste better when soaked. Soak most beans in three times their volume of cold water for six hours before cooking. Dried beans are often soaked too long. Most recipes say overnight. The best way is to put them in cold water; bring them gently to a boil and then with saucepan off the heat, allow them to remain in the water for 1 to 2 hours only. If soaked too long, they may ferment, which affects their flavor and makes them difficult to digest. To help in the digestion of beans, always discard the water in which they were soaked. Do not add salt or acidic ingredients, like vinegar, tomatoes or tomato juice, as this will slow the cooking process. Instead, add these ingredients when the beans are just tender. Speed soaking method for dried beans: Rinse and sort beans and place into a large pot covering with 1-inch of water. Over high heat, bring beans to a boil and let continue to boil 5 minutes, uncovered. Turn off heat and cover beans with lid and let soak for 1 hour. Drain liquid from beans and set aside pot of beans until ready to use. Place the dried beans into a large pot or Dutch oven. Soak the beans overnight in warm water. This will help to soften them. In the morning drain off the water and pour in enough chicken broth until the bean mixture is covered by about 1-inch of water. Note: If you don’t have time to soak beans overnight see instructions for Speed Soaking Method. In a large skillet over medium high heat, pour in enough olive oil to coat bottom of the pan. Add the Andouille sausage slices and cook until browned around the edges. Remove the sausage with a slotted spoon and place in the pot with the beans. Using the sausage drippings in the skillet, add the onion, bell pepper, celery, and garlic and saute approximately 5 minutes or until the vegetables are tender. Add the bay leaves, thyme, pepper, Creole Seasoning, and basil leaves to the skillet; stir and saute together for a few minutes to allow the flavors to meld. Add vegetable mixture and ham hock to the pot of beans and sausage, stirring to combine. Place the pot of beans on large stove burner over medium-high heat. Bring just to a boil, then reduce heat to medium low, cover with lid, and let simmer for 2 1/2 to 3 hours or until beans are soft and tender. Remove the bay leaves and discard. Remove the ham hock and cut off the pieces of ham meat to throw back into the pot. Discard the bone. When ready to serve, take 1 to 2 cups of beans and add to a blender; cover with lid and blend until a smooth puree texture. Stir bean puree back into pot of beans and cook until heated through. As an alternative, if you do not have a blender, use a wooden spoon to smash 1/4 of the bean mixture against the side of the pot and stir back into beans. Add salt and pepper to taste. Serve beans and sausage over plate of hot cooked rice and garnish the top with a little fresh basil. Add Tabasco sauce to taste and enjoy! Place the dried beans into a large pot. Soak the beans overnight in warm water. This will help to soften them. Note: If you do not have time to soak beans overnight see instructions for Speed soaking method. Drain off the water that beans were soaking in overnight. Place the beans in the slow cooker and pour in enough chicken broth till the bean mixture is covered by about 1 inch. In a large skillet over medium high heat, pour in enough olive oil to coat bottom of the pan. Add the Andouille sausage slices and cook until browned around the edges. Remove the sausage with a slotted spoon and place in slow cooker with beans. Using the sausage drippings in the skillet, add the onion, bell pepper, celery, and garlic; saute approximately 5 minutes or until the vegetables are tender. Remove from heat and add the vegetable mixture to the slow cooker. Add the ham hock, bay leaves, thyme, pepper, Creole Seasoning and basil leaves to the slow cooker and stir to combine with beans and sausage. Cover with lid and cook on low heat for 8 to 10 hours or high heat for 4 to 5 hours until beans are tender. Remove the bay leaves and discard. Remove the ham hock and cut off the pieces of ham meat to throw back into the slow cooker. Discard the bone. When ready to serve, take 1 to 2 cups of beans and add to a blender. Cover with lid and blend until a smooth puree texture. Add bean puree back into slow cooker and stir to combine with bean mixture. Cook until heated through. As an alternative, if you do not have a blender, use a wooden spoon to smash 1/4 of the bean mixture against the side of the pot and stir back into beans. Add Salt and pepper to taste. These instructions are using dried beans that have not been pre-soaked. If you prefer to soak the beans overnight (or see instructions for speed soak method) see the notes below for Alternative Quick Pressue Cooking Method. Select the Saute button, and High heat setting. Wait until the settings show a "Hot" status. Add olive oil to coat bottom of the inner pot. Next add the Andouille sausage slices and cook for 5-7 minutes until browned around the edges. Remove the sausage with a slotted spoon and set aside. Keep the sausage drippings in the inner pot, add the onion, bell pepper, celery; saute 3 to 4 minutes or until the vegetables are tender. Then add the garlic and saute for 30 seconds until aromatic. Press the Keep Warm/Cancel button to turn off. Place the dried beans in the inner pot with the vegetable mixture and pour in enough chicken stock till the bean mixture is covered by about 1 inch. Add the ham hock, bay leaves, thyme, pepper, Creole Seasoning and basil leaves to the inner pot and stir to combine with beans. Note: Make sure pot is no more than 1/2 full. You may have to adjust amount of beans and liquid depending on the size of your pressure cooker pot. Place the lid on the Instant Pot and close to seal. Make sure the pressure valve is also closed. Select the Manual button and High Pressure. Set the cooking time for 30 minutes and allow the pressure to natural release (about 15-20 minutes) until the pin is dropped and fully depressurized before opening the lid. Remove the bay leaves and discard. Then remove the ham hock, cut off pieces and ham and add the ham meat back to the inner pot. Discard the ham hock bone. Open the lid and stir in the andouille sausage. Place the lid back on the Instant Pot and close to seal. Make sure the pressure valve is also closed. Select the Manual button and High Pressure. Set the cooking time for 15 minutes. When the cooking time is completed, quick release the pressure valve. Alternative Quick Pressure Cooking Method: To use with pre-soaked or speed soaked beans only. After browning the sausage and sauteing the vegetables, dump all ingredients into the Instant Pot along with the (pre-soaked or speed soaked) beans, ham hock and add enough chicken broth to cover ingredients by 1 inch. Place the lid on the Instant Pot and close to seal. Make sure the pressure valve is also closed. Select the Manual button and High Pressure. Set the cooking time to 20 minutes. 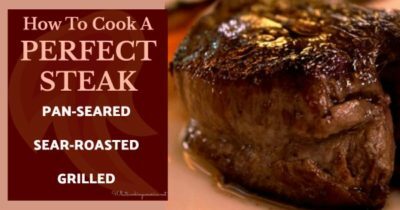 When the cooking time is completed, allow the pressure to natural release (about 15 to 20 minutes) until the pin is dropped and fully depressurized before opening the lid. When ready to serve, take 1 to 2 cups of beans and add to a blender. Cover with lid and blend until a smooth puree texture. Add bean puree back into Instant Pot and stir to combine with bean mixture until heated through. As an alternative, if you do not have a blender, use a wooden spoon to smash 1/4 of the bean mixture against the side of the pot and stir back into beans. Add Salt and pepper to taste. This is the type of pressure cooker that I prefer to use in my cooking: I get readers asking which electric pressure cooker brand I prefer to use for cooking. 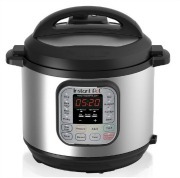 I personally use the Instant Pot Multi-Use Pressure Cooker. I love having 7 cooking functions in one space saving appliance – Pressure Cooker, Slow Cooker, Rice Cooker, Saute Pan, Steamer, Yogurt Maker and Warmer. Learn more tips on How to Use an Instant Pot Pressure Cooker. This recipe looks delicious! Since I don’t eat pork, what would be a good substitute for the ham hock? How about substituting the ham hock for some smoked turkey sausage? I use smoked turkey wings – it’s delicious! It is worth noting in the recipe when you soak the beans overnight, you DON’T need 2 quarts of chicken stock in the instant pot. There should be a recipe adjustment. I used about a quart and a half (enough to cover) and it was still about 2 cups too much, maybe more? But I’m new to the instant pot so not super comfortable with making recipe adjustments on my own. That being said, it was delicious in flavor and the beans were cooked perfectly, other than being more of a soup. Thank you! Hi, Melanie – Thanks for your comments, in the Instant Pot instructions it is noted that the dried beans do not need to be soaked overnight. Also, the instructions say to only add enough broth to the Instant Pot so the beans are covered by 1 inch of liquid and to not fill the pot more than 1/2 full since the beans need room to expand. The 2 quarts are listed on the ingredients list to use for all cooking methods, you just need to adjust the broth according to the instructions for the cooking method provided. For the consistency, the instructions provided advised to take out a couple cups of the cooked beans to puree in the blender or mash with a wooden spoon, then stir back into the bean mixture for a thick and creamy consistency. Thanks for the catch! This has been fixed on the recipe. Once the pressure has released and the pin has dropped on the Instant Pot, open the lid and remove the bay leaves and discard. Also remove the ham hock and cut off any pieces of ham and add back to the inner pot. I am making this right now and agree that it would be nice to mention in the instant pot alternative method to “dump in all ingredients except chicken stock or half stock” because I have no idea what I should do now. Pressure cookers need liquid right? So I guess I will put in a cup. 🤷🏻‍♀️ I hope this turns out. Liquid is essential when your cooking dried beans and the Instant Pot instructions clearly state to pour in enough chicken stock to cover the dried beans by 1-inch over the top. First.. I just wanted to thanks for allbof alternative ways you provided to cook this dish.